Preheat oven to 350 degrees with one oven rack in the center of the oven and one directly below it. Place a cookie lined with foil on the rack below the center rack. This will catch any caramel that may boil over during the baking process. Do not put the cast iron pan and cookie sheet on the same rack as it can adversely affect the air flow and thus the baking of the cake. Put cornmeal in a small bowl. In a small saucepan, bring the coconut milk to a boil, then pour over cornmeal. Stir, cover, and let stand 30 minutes at room temperature while you prepare the next steps. Sift together the flour, baking powder, and salt into a medium-sized bowl. Set aside. In the cast iron skillet and over just-under medium heat, melt the coconut oil, then add the coconut sugar. Stir continuously until the sugar melts, being mindful that the sugar does not go up the sides of the skillet. It will not completely blend with the coconut oil, but will be smooth and glossy. Take skillet off the heat. Be careful with this step. Hot caramel (your melted sugar mixture) will give you one heck of a burn if it gets on your skin. 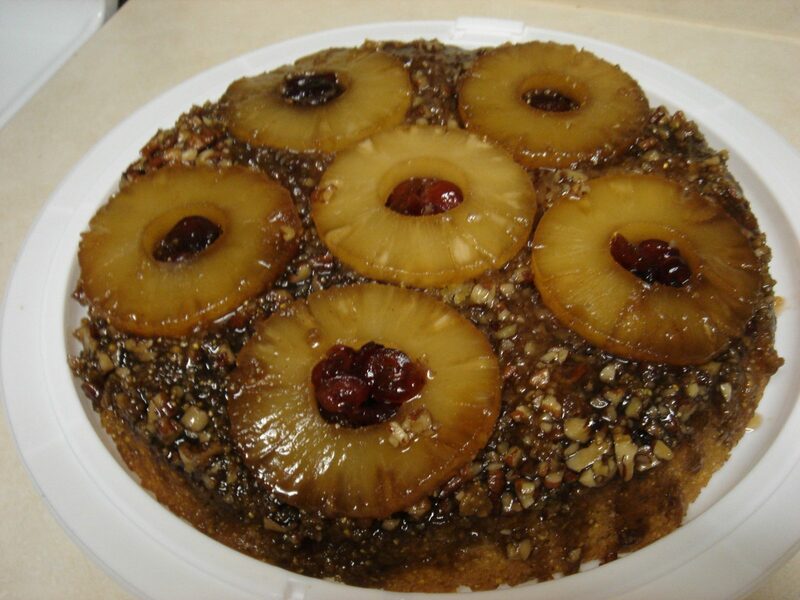 Gently place one slice of pineapple in the center then place the remaining five slices around the center slice. Place 6-7 cranberries in the center of each pineapple slice. Using a spoon, gently press the cranberries down in the caramel. Evenly sprinkle the chopped pecans over the top of the caramel and fruit. In large mixing bowl and with an electric mixer (stand mixer and a hand mixer both work well), beat the yogurt and 1 tablespoon coconut oil until well incorporated. Add the Egg Replacer and beat until well incorporated. Add the 5-3/4 ounces coconut sugar to the yogurt mixture, and beat at high speed for at least two minutes. The goal is for the sugar to incorporate into the yogurt mix, and for the mix to become light and fluffy. Add the coconut oil to the yogurt mixture and beat at high speed until well incorporated. On medium high speed, mix the cornmeal into the yogurt mixture until well dispersed. Add the flour mix to the yogurt/cornmeal and beat at medium high speed to fully incorporate and complete the cake batter. Gently pour the cake batter over the fruit and nuts in the cast iron skillet and spread evenly. Bake in oven for 40-45, until a toothpick comes out clean. Be careful when removing cake from oven. Cool for 30 minutes in the skillet. This is an important step. Attempting to release the cake too early will cause the cake to fall out in pieces. On the other hand, leaving it in too long will cause the caramel to cool at the bottom of the skillet, causing it to stick and not release. Be sure to be ready to invert the cake out of the skillet at the completion of the 30-minute cooling time. Run a sharp knife around the sides of the cake in the skillet, being careful not to disturb the cake, but to loosen any caramel from the sides. Place a platter on top of the skillet. Using oven mitts because the skillet will still be quite warm, invert the cake onto the platter and remove the cast iron skillet.